Congratulations to Caitlyn and River on earning their FMX (Flyball Master) title at Scallywag's tournament on Feb 21, 2018! Dirt Road Dawgz had a great time running together at our first tournament in a while and loved that we could be there for River earning her title! We are so happy that Caitlyn, Kelly, River, and Cody have joined the Dirt Road Dawgz and look forward to many fun tournaments with them! Congratulations to Tori, our awesome Borderwhippet owned by Sue, who debuted on October 28, 2017 and hasn't stopped running since! Tori loves racing and is only getting faster each time out. Sue and Tori are a great team and we love watching these two work together. We can't wait to see what the future holds for these two! Congratulations to Tori and Buster, who both earned their FDCh-S on December 31, 2017. So fun to have these two earn their titles together. Congratulations Luke and Lucy ONYX! Congratulations to Luke, our cavalier king charles spaniel owned by Jen, on earning his ONYX in April and becoming the first Dirt Road Dawg to earn an Onyx! We love running with Luke and Jen! Congratulations to Lucy, our awesome mix owned by Lea, who joined us this year and earned her ONYX in October! Lucy and Lea have been a wonderful addition to the Dirt Road Dawgz and we look forward to many more races with them! Congratulations Buster FDX and MBD! Congratulations to our newest team member, Buster the cocker spaniel and his handler Sue! Buster debuted at the No Speed Limit tournament October 29-30 and earned his FD(flyball dog) and FDX (flyball dog excellent) titles. He ran again at the CU New Years Tournament and earned his MBD(Multi-breed dog). 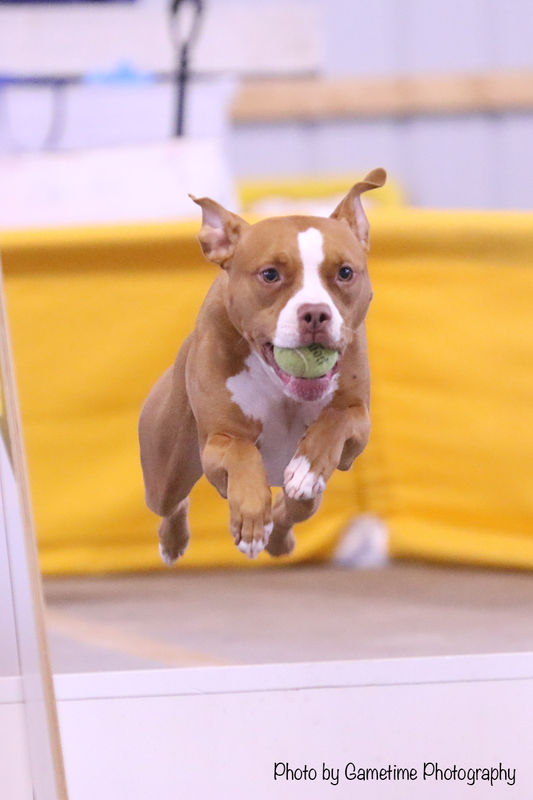 We are excited for this awesome dog’s future in flyball! He’s so fun to watch as his confidence continues to grow. Flyball classes are being held at Breakaway Action Dogs (BAD) in Frederick, MD starting Thursday, January 5. Beginner class starts at 7:15 and Advanced class starts at 8:30. Email me at info@dirtroaddawgz.com for more info.